Sanger sequencing of DNA (also known as the early DNA sequencing technique) utilizes early chain termination in order to sequence the DNA by utilizing a short DNA primer and di-deoxynucleotides. The DNA polymerase enzyme elongates the DNA primer complimentary to the DNA sequence of interest, and incorporates the normal deoxynucleotides. However, when the di-deoxynucleotides are incorporated, the chain is no longer elongated and it trigers chain termination as these nucleotides do not have the 3′-hydroxy group required to produce the phosphodiester linkage. This animation describes the process of sanger sequencing in detail. We also recommend you check out another animation of Cycle Sequencing. Two sequencing techniques were developed independently in the 1970s. The method developed by Fred Sanger used chemically altered “dideoxy” bases to terminate newly synthesized DNA fragments at specific bases (either A, C, T, or G). These fragments are then size-separated, and the DNA sequence can be read. Fred Sanger’s method of DNA sequencing was based on Arthur Komberg’s earlier work on DNA replication. Remember that a new DNA strand is synthesized using an existing strand as a template. To illustrate the technique, let’s use poly-thymine DNA as an example. The 5’carbon on an “incoming” dexoynucleotide (dNTP) is joined to the 3’carbon at the end of the chain. Hydroxyl groups in each position form ester linkages with a central phosphate. In this way, the nucleotide chain elongates. 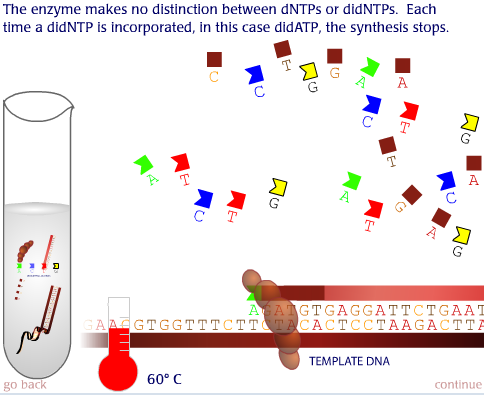 The key to Sanger’s sequencing method is the peculiar chemistry of dideoxynucleotides (did NTP). Like a deoxynucleotide, a didNTP is incorporated into a chain by forming a phosphodiester linkage at its 5’end. However the didNTP lacks a 3’hydroxyl group (OH) necessary to form the linkage with an incoming nucleotide. So, the addition of a didNTP halts elongation. One type of didNTP n A,T,C, or G n is added to each. Lets focus on the adenine (A) terminator reaction. First the DNA is denatured into single strands at near boiling temperature. At high temperatures, the kinetic motion of the DNA molecule disrupts the weak hydrogen bonds that join complementary DNA strands together. When the temperature is lowered, the primer binds to its complimentary sequence in the template DNA. Komberg’s earlier work showed that a primer is needed for DNA polymerase to start replication. The DNA polymerase makes no distinction between dNTPs or didNTPs. Each time a didNTP is incorporated, in this case didATP, synthesis is “terminated” and a DNA strand of a discrete size is generated. In this sequencing example, the didATP (purple) has terminated the reaction. The dATP happens to be the radioactive tracer but this has no effect on elongation. Because billions of DNA molecules are present, the elongation reaction can be terminated at any adenine position. This results in collections of DNA strands of different lengths. The same is true for the other three terminator reactions. Each reaction is then loaded into a separate lane of a polyacrylamide gel containing urea, which prevents the DNA strands from renaturing during electrophoresis. Ionized phosphates give the DNA molecule a negative charge, so DNA migrate toward the positive pole of an electric field. The movement of DNA molecules through the polyacrylamide matrix is size dependent. A blue dye that also migrates to the +pole is added to the samples to track the progress of DNA in the sequencing gel. The dye runs just a little faster than the smaller fragments of DNA. Over the course of electrophoresis, shorter DNA molecules will move further down the gel than larger ones. Millions of terminated molecules of the same size will migrate to the same place and “band” in the gel. After electrophoresis, the gel is sandwiched against X-ray film. The radioactive adenine in the synthesized DNA emits beta particles that expose the film, making a record of the positions of DNA bands in the gel. The sequencing gel is then “read” from bottom to top. The sequence of bands in the various terminator lanes gives the sequence of nucleotides in the template DNA. A typical sequencing reaction will yield 200-500 base pairs of readable sequence. Have you tried using a different browser? Which browser are you using?